In a post a couple of weeks ago on banking dividends I mentioned that one of the vaunted Dividend Kings – those companies with 50 or more years of consecutive dividend growth – is a mid-cap banking stock. The stock in question is Farmers & Merchants Bancorp, which is a holding company for a small regional bank operating out of California called Farmers & Merchants Bank of Central California. 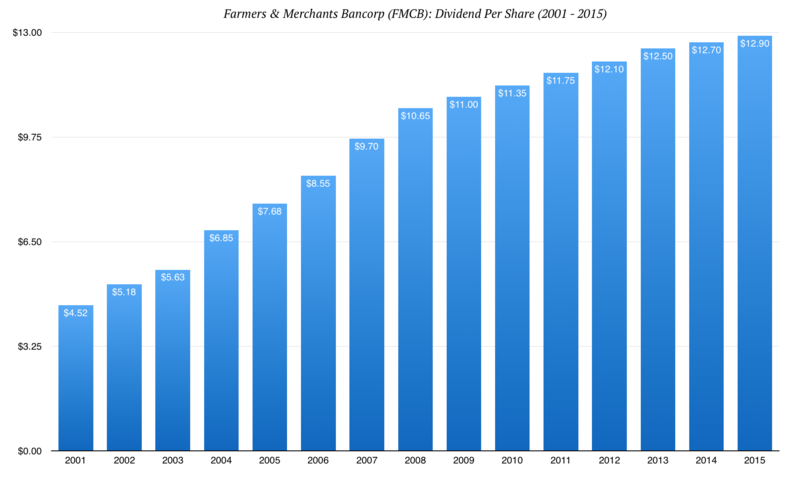 Just to confuse matters there are actually a number of “Farmers and Merchants Banks” scattered across the United States – I’ve come across three so far, all with illustrious dividend histories. 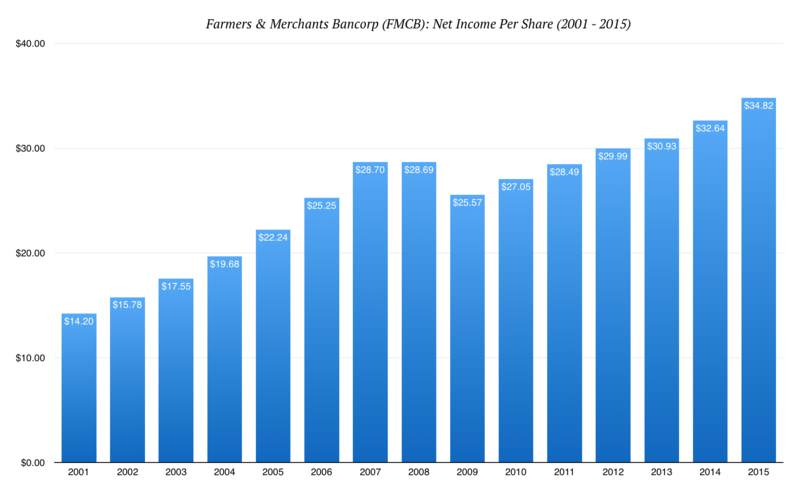 I’ll do brief write-ups on all of them, plus any more regional bank gems that I stumble upon, but for now let’s start with Farmers & Merchants Bancorp (ticker code: FMCB). Dividend growth aficionados will have no doubt come across this one on the Dividend Kings list, sticking out like a sore thumb next to much bigger and more illustrious names like The Coca-Cola Company, Procter & Gamble, Johnson & Jonson and Colgate Palmolive. To get some sense of scale for FMCB’s operations consider some of the basic fundamentals from 2015: net income came in at around $27.5m, the year end book value was around $250m and the year-end market capitalization was approximately $420m. Rather than talking about scale advantages we’re seeing a company that relies on the quality of its customer service in order to foster its competitive advantages. That’s something that only gets built up slowly over the years. They were founded exactly one hundred years ago this year, followed by a first dividend to stockholders in 1935 – during the middle of the Great Depression no less – and they have managed to increase that payment in every single year since the mid-1960s, including during the global financial crisis. As it stands today the company is in its 82nd year of consecutive dividend payments. In other words it’s a cash cow; banking at its boring best, which probably explains why hardly any trades go through. Even the company’s motto gives a nod to their track record: safe & secure since 1916. How many North American bank stocks can say they increased their dividends during the worst years of the global financial crisis between 2007 and 2009? Not too many I’d wager. People just don’t like to give up assets that can churn out that kind of cash. Even the big Canadian bank stocks with a history of uninterrupted dividends going back 183 years had frozen their payments in 2008. Take a look over just a twenty year period going back to the start of the century. Let’s imagine you manage to pick up $50,000 worth stock in January 2001, which at a then share price of $225 nets you 220 shares. Let’s also say you’re happy to treat it as a private enterprise, owing to how little the stock trades. You collect your dividend payments every year but never touch the initial capital. Over the following fifteen years you see earnings per share rise from $14.20 to $34.82, compounding at a rate of 6.60% per year. The share price, now trading at about $600 per share, has risen at a rate of 7.25% compounded per year, turning the initial $50,000 investment into $132,000 today. In addition you’ve seen fifteen and a half years of increasing dividends paid out to you, adding up to a combined total of about $31,475. You’d also have seen a 5% stock dividend every year up to 2005, giving you an extra $37,000 worth of shares to add to your capital. Your total return would therefore be approximately $205,000, which works out to compounded annual rate of 10.5% per year. It’s not some perfect investment that can give you a rising share price every year. If you bought in at the end of 2006 when you’d have been paying about 3x book value to own the underlying business then you’d have seen rather little by way of capital appreciation. What you do have is a stock that can throw off high quality cash flow on a regular basis; its profits tend to increase at a decent rate over time, as does its underlying book value. These types of investments aren’t going to make you rich over night but, over a decent long-term horizon, will tend to leave you significantly better off than when you started – perfect for a long-term dividend portfolio.